Brewster Barn with Darv's Cowboy Custom Rustic Hand Hewn Furniture added 3 new photos. Beautiful. I'd love to have a tbl like that! Don't "like" - LOVE this table! Maybe a bears in rug , and a hat on the bed . Lol . I always thought it lucky , that it wasn't on the floor. Darv Averill was born a cowboy. He broke his teeth in on a rope and has had one in his hand ever since. 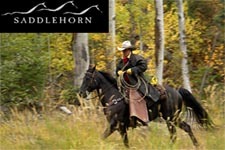 Raised on the shores of Flathead Lake in Bigfork, Montana on the nationally know guest ranch, Flathead Lake Lodge he became known as one of the finest cowboys around. Darv was inducted in 2007 into the Montana Cowboy Hall of Fame for his six consecutive Calf Roping Championships. As the six time World Champion All-Around Cowboy Larry Mahan said at Darv’s Hall of Fame Induction, “You can say all you want about them NFR cowboy’s. Yes, they have worked hard to be there and they have the talent but rest assured these Montana cowboys will beat you all day long and on a daily basis. Many of them could have been NFR champions but because of money or just their preference to stay on the ranch they never pursued that path. They rope because they love too!” And that was and still is Darv Averill. Darv specializes in his own designs and has been trusted to create pieces for top designers and VIP’s. He is also very happy to visit with you in length about your thoughts and ideas and help you put the finishing touches on your design. All pieces are made with reclaimed woods and can be created in dark woods, light woods or painted surfaces. If given the opportunity to visit with Darv Averill you are quickly taken by the depth of his passion as he describes the birth of his latest creation. Darv has been creating fine pieces for over thirty years. His furniture has been featured several times in Architectural Digest, graces the homes of VIP’S, makes an impressive statement in offices, conference rooms and restaurant dining rooms and lounges. But designing those special pieces for the home is Darv’s greatest pleasure. He takes great care in capturing the essence of the cowboy character in every piece he creates. 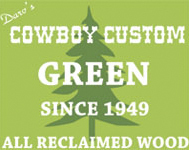 Cowboy Custom has been Green Since 1972! Whether or not you agree with global warming or all the reasons to become more self-sufficient is irrelevant. For whatever reason awareness and care has been heightened, all that really matters is that it is finally happening. We at Cowboy Custom are committed in any way possible, big or small, to make the sky bluer, the water clearer, the fields greener and the world healthier for generations to come. Our efforts are dedicated to our six grandchildren who bring us great joy when we see them running through the pasture, gulping huge laughter breaths of magnificent mountain air. To God be the glory! Omg, do I feel like a fool.I can't even put a point on a match stick. Extremely nice wood work. How would one go by getting a price list. Brewster Barn with Darv's Cowboy Custom Rustic Hand Hewn Furniture shared a link. Does anyone see the cow (middle of pic) or the cow eyes (bottom) or am I crazy????? Copyright © 2019 Brewster Barn. All rights reserved.